So much to love in the Free People Fall 2018 collection! This post about the Free People Fall 2018 collection contains affiliate links. Please read this blog’s disclosure post for more info. Picture this. Skirts so short they probably don’t clear most people’s butts. Dresses with daringly low-cut necklines. An entire activewear section dedicated to clothing that most people probably can’t work out in. A page dedicated specifically to healing crystals. A ski shop filled with needlessly expensive items. Few retailers could get away with such craziness. Yet Free People not only gets away with it — it’s part of what makes them amazing! I sometimes shake my head in disbelief. How do they pull it off? (Great styling.) The Free People Fall 2018 collection is is full of appealing stuff. My wishlist is over 300 items right now! Let’s take a look at some of the highlights. NOTE: Bonus! In addition to all these pretty new arrivals, Free People is also offering an extra 25% off sale, today only! Another shade of the skirt, shown with a great long cardigan. Part of my plan is to make a wishlist for Free People’s big one night only shopping event in mid-November, where they offer up to 25% off your purchase for 4 hours on a Friday evening. However, I can’t wait on everything because Free People’s items often sell out long before they make sale. Sometimes, even right after they debut! Most recently for example Free People launched a curve-friendly jean line that is amazing. I’m possibly overusing the italics in this post because I’m so impressed. They are the best curvy jeans I have ever tried on. Free People’s in-house styling team is surely worth its weight in gold. They are so adept at making the clothing look wearable and amazing. Somehow the team makes me take a look at items I’d never think of on my own, and generally puts together outfits that are very appealing. Yes there is some craziness too — it wouldn’t be Free People without a bit of the crazy! And so, I end up thinking to myself, Why yes I do need a pair of these wide leg pants, perhaps two colors even! And how could I go without a satinesque polyester skirt in a color or two? Such is my Free People shopping experience. They delight me with items outside of my norm and those items tend to shockingly last in my closet year to year. My closet therefore has insane pieces like the Meadow Fields Boot ($248) in black, which is clearly a ridiculous pair of boots. Of course I get stopped on the street all the time by fellow fashionistas who want to know where I got them. They got the nod of approval from a very well-known fashion magazine editor in chief during New York Fashion Week recently, and beyond that, I love them! I did not know I needed a pair of fringe boots in my closet until these came along. Am I crazy? Most assuredly. I’ve also been quite well served by the Love of My Life Midi Dress ($108). Pretty much every weekend this dress comes out as the hot, humid weather holds on to NYC. Because it’s so low cut I do wear a cami with it. 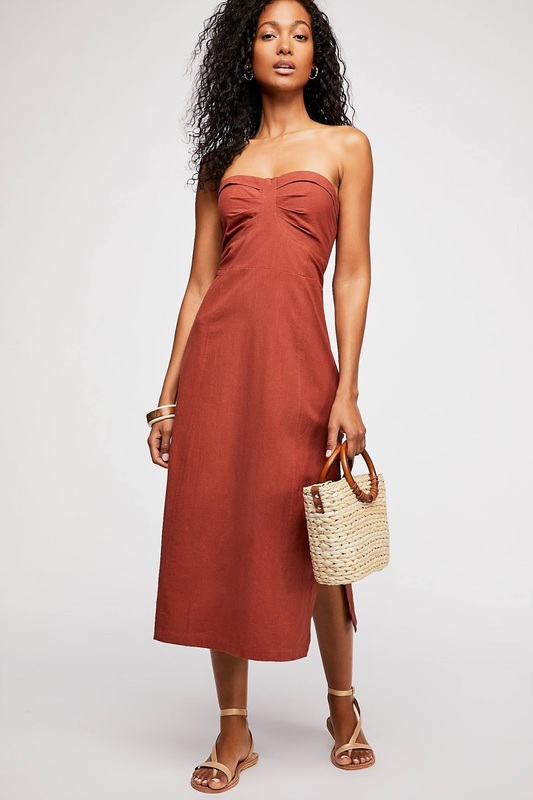 This dress looks great with the Dana Point Layering Necklace ($38) which I bought years ago — happy to see Free People still carries it. I love that I can rely on Free People for slinky intimates too. The Willow Printed Mini Dress ($88) has been a big hit at home, as has the Slinky Slinky Tank ($20). I often layer the latter over another tank top outside the house for a cute weekend look. While I’ve mostly turned to Aerie for my bralettes due to better support I do own and love several colors of FP’s Galloon Lace Racerback ($20) bralette. Free People is bountiful in the accessories department, too. Few stores can convince me that a belt bag is something I want or need — but Free People can! Their handbag designs generally tend to be fun and inexpensive, which is a good combination for trendy pieces. They’ve mixed in some pricier, buttery leather options that are well worth the splurge if you’re on the hunt for an investment piece. My wishlist currently includes the Vivian Bucket Bag ($58), the Charlotte Top Handle Crossbody ($58) and the Leather Box Bag ($48). I’ve included lots of my favorites in the huge shoppable boutique concluding this post. I can always depend on Free People for beautiful costume jewelry. So many of my necklaces are from FP. At the moment I’m eyeing the Faye Collar Necklace ($38), the Hazel Pendant Necklace ($38) and the 14K Female Diamond Necklace ($618). I’ll pair those with rings and earrings from Free People too. We haven’t even talked about boots or shoes yet. So many cute options, so many picks on my wishlist! Plenty of great options in the post-ending shoppable boutique. With just a little bit of hunting, you can even find some pieces like Anthropologie used to carry at Free People. I love the simple structure of the Italian Love Story Dress ($78, above in yellow). It’s the kind of piece I used to find at Anthropologie. 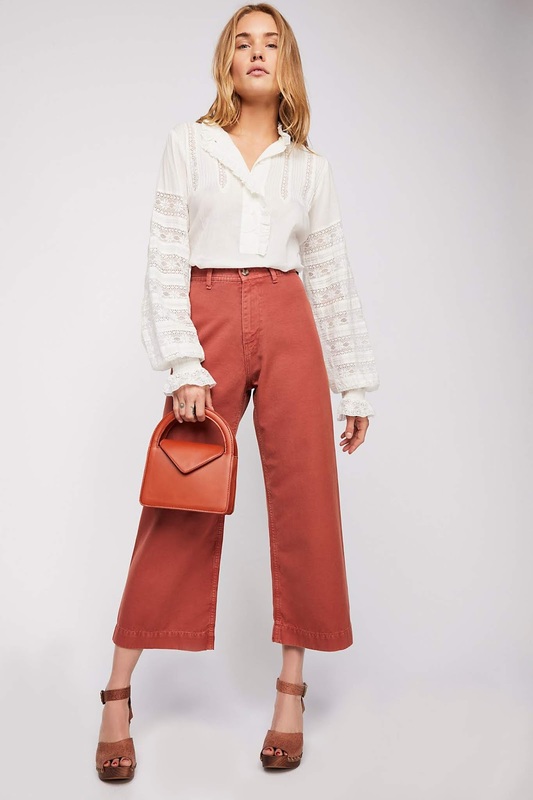 Much like their sister store, Free People’s huge selection borders on overwhelming at times, so I’ve dug through the entire FP site to bring you the best picks in the shoppable boutique below. What are you loving at Free People right now? Previous Post Have you seen the great deals in the Banana Republic October 2018 Fall promo? Next Post The selection is pretty good in the Anthropologie Now $98 promo! Thanks for all your favorite picks, I always love to see what other people like. There is just so much to love at Free People right now but then again, I can always find some goodies there pretty much every season. Fall time is the best though and I've scored quite a few gems myself recently. I think my most favorite dress of all is the Embroidered Fable dress which I have in two colors. It's the only dress I've ever bought twice because it's that special and easy to wear. I like that it has a hook at the bust so I don't have too much of a low cut look. Most of Free People is so low cut but I'm okay with sewing a few stitches or adding a hook and eye if I really like something. It's just not too hard to find something actually pretty at this store. Your welcome Jess! I owned the Embroidered Fable Dress last year. I loved it, but ultimately decided it was a little too short on me and gave it to a friend. I agree that a few stitches or a bit of creative layering is all that's needed to make the low cut stuff work. I think Free People also had the cutest embroidered jumpsuit very similar to the Fable dress embroidery but it's long gone, I just wish they'd come out with it again in like a gorgeous wine color. Oh, I love the Embroidered Fable dress! I have a few of them, and they get a lot of wear every spring and fall. FP always has a nice selection of colors for the Fable each season too so it's easy to want more than one hehe. I have it in a purple/wine and deep forest green color and now I'm eyeing the yellow. The wine was so pretty – missed out on that one! I have it in red, black, olive and teal. Ooh teal sounds SO pretty for that dress! Yes, thanks for your post! I think I'm going to order the Italian Love Story Dress in black(since yellow is gone) and if its too short use it as a tunic with jeans etc. Seems like it would be cute either way. That's a cute dress klj1! I think it could be really cute either way as well and black is always a good color. I'm so glad I'm not the only one already preparing for the 25% annual sale. 🙂 There are only 1 or 2 items I'm seriously considering, though. I don't have a long wishlist anywhere this year. Those fringe boots are stunning. If I didn't already have 2 pairs of fringe boots I'd be wishlisting those! That Johnny Was bag is just gorgeous, oh my and those sandals but the price…wish there was a shoe sale going on right now. I'm wishing for a shoe sale too!! That Paisley Park jacket is heavenly Anthropolitan! And exactly what I mean about FP, crazy but lovely. Love this post! Not to talk about Anthro, but I finally found something I actually like and was wondering if anyone knows if a promo will be happening soon? I'm sure we'll get a 20% off weekend this month, if that's what you mean. They've been doing lots of promos lately! I can’t imagine how long it takes you to put together your shoppable boutiques Roxy but omg, SO much to love! Thanks for showing us your favorites. I think I just added 20 items to my wishlist! There is now more stuff I like at FP than at Anthro. I'm fine with that, but I just really wish they would cut down on the amount of tops that are cropped. I would buy much more from them if this weren't so often the case. I like the youthfulness of FP but the skimpiness of many of the cuts won't fly for me in terms of my comfort zone. I hear you Guest, and a good chance FP hears you too!